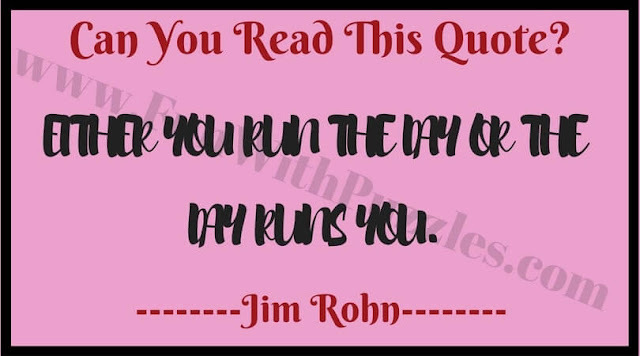 In this reading riddle, a famous Quote by "Jim Rohn" is given as picture puzzle image. However to give your mind a reading challenge this Quote is written in such a font that it is little difficult to read this quote directly. However if you put pressure on your mind, you will be able to read this quote easily. Lets see how much time you take to read this Quote? Answer of this Quote is given at the end. This Quote is "Either you run the day or the day runs you." 1. Intelligent Reading Riddles to Twist your brain: It contains many different reading brain teasers to twist your brain. 2. Intelligent Reading Brain Teasers to Twist your brain: It contains intelligent reading brain teasers to give challenge to your mind. 3. Fun Brain Test to prove that your brain is lazy? : Here are very interesting brain teasers which will prove that your brain is lazy. 4. Picture Brain Teaser to find Odd One Out: In this Picture Puzzle, your challenge is to find out which picture is different out of four similar looking pictures.